Callum Elder could play in a more central defensive position for Posh against Barnsley. Photo: Joe Dent/theposh.com. Peterborough United manager Graham Westley is adamant that bigger crowds will soon be flocking to the ABAX Stadium. Westley was speaking ahead of tonight’s (November 24) League One home game with Barnsley. Posh attendances often drop below 5,000 for Tuesday night games, but the first-team manager believes the product his team is serving up is too exciting to ignore. “When the James Bond film came out the other week every one wanted to go and watch it,” Westley stated. “They want to go because they know entertainment is guaranteed and that is pretty much the case with our football team at the moment. “It’s inevitable gates will go up because everyone will hear how exciting and entertaining we are. We play football in the right way and we score lots of goals. We are also committed to improving the product on a game-by-game basis. Westley would not be drawn on how he intends to solve the problem at the heart of the club’s defence tonight. A one-game suspension for Ricardo Santos means he will miss out as will fellow central defenders Jack Baldwin (suspended), Gaby Zakuani (injured) and Shaun Brisley (injured). On-loan Chelsea defender Alex Davey appears to be completely out of favour which means that regular full-backs Michael Smith or Callum Elder could be asked to play in a more central defensive position. Andrew Fox and Tobi Adebayo-Rowling are capable of filling in at full-back. 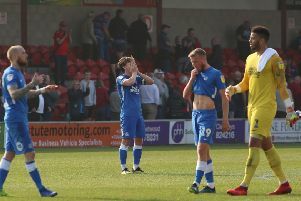 Westley is still confident Posh will overcome a Barnsley side who broke an eight-game losing streak at Oldham on Saturday (November 21), even though home Tuesday games in League One have not yielded a single victory since April 2014. “I’ll hand my teamsheet in at 6.45pm and then everyone will know what we have planned,” Westley added. “We’ve not changed the side for three games apart from to cover Gaby Zakuani’s injury and the players are all performing as though they are desperate to hold on to their shirt. “It’s a shame for Rico (Santos) to miss out, but a rest will probably do him good and one man’s misfortune is another man’s opportunity. We’ve not in the past recovered well when we’ve had matches on a Saturday and a Tuesday, but the lads looked in great shape yesterday morning. Recovering properly is an art form and I could tell yesterday that my players had done it exactly right. They trained with a great tempo. “It won’t be easy tonight as Barnsley are like Fleetwood in that they are in a false position. They’ve recently brought in some good loan players as they try and get away from the bottom four, but as always our focus is on our own performance.